Books in the innovative Foreign Language Word Puzzles series help students of foreign languages learn vocabulary and word meanings by working out a succession of fun-to-do word puzzles. 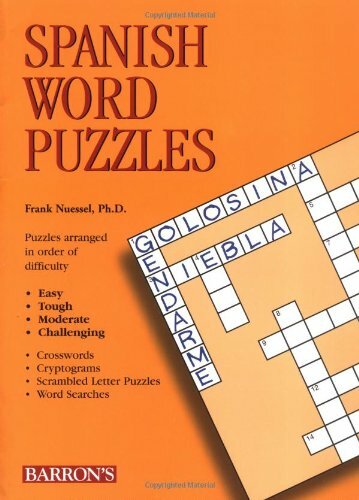 Featured in each book are crosswords, word crosses, scrambled-letter puzzles, and cryptograms. All questions and clues are printed in English, but all answers in this puzzle book must be in Spanish. Puzzles are arranged in order of difficulty, beginning with Easy crosswords, word crosses, scrambled letters, and cryptograms, then progressing in the same order of puzzle types to Moderate Level, Tough Puzzles, and finally to Challenging Puzzles. Answers to all puzzles are presented at the back of each book. Type is set in two colors.